Franklin's early death from ovarian cancer in 1958, aged just 37, meant she never received the recognition given to her male peers. "In the last year of Rosalind's life, I remember visiting her in hospital on the day when she was excited by the news of the [Soviet Sputnik satellite] - the very beginning of space exploration," Franklin's sister, Jenifer Glynn, said on Thursday. 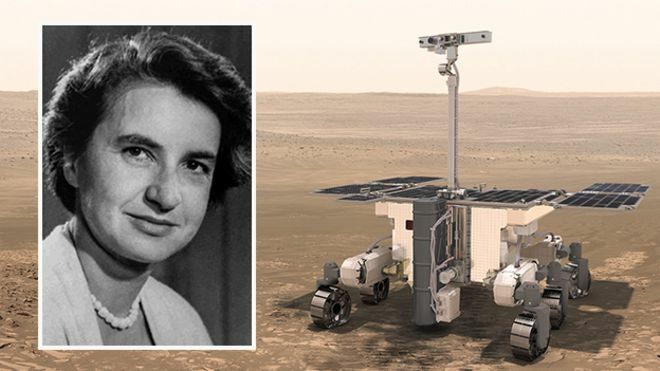 "She could never have imagined that over 60 years later there would be a rover sent to Mars bearing her name, but somehow that makes this project even more special." In 1952, Rosalind Franklin was at King's College London investigating the atomic arrangement of DNA, using her skills as an X-ray crystallographer to create images for analysis. One of her team's pictures, known as Photo 51, provided the essential insights for Crick and Watson to build the first three-dimensional model of the two-stranded macromolecule. 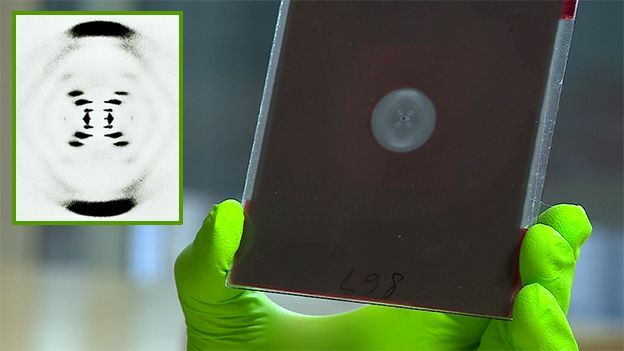 It was one of the supreme achievements of 20th Century science, enabling researchers to finally understand how DNA stored, copied and transmitted the genetic "code of life". Crick, Watson, and King's colleague Maurice Wilkins, received the 1962 Nobel Prize for the breakthrough. Franklin's untimely death meant she could not be considered for the award (Nobels are not awarded posthumously). However, many argue that her contribution has never really been given the attention it deserves, and has even been underplayed. Up until now, the rover has simply been known by its Esa project name - ExoMars. In the UK, many people have also become familiar with the names given to the prototype robots that Airbus built to trial the vehicle's technology. These have been names like Bridget, Bruno and Bryan. The "B" letter is a play on the word "breadboard" - the term describing the bald plate engineers use to design new electronic circuitry. For recent European Space Agency projects, Italian scientists have been honoured, including Giuseppe "Bepi" Colombo (Mercury mission) and Giovanni Schiaparelli (a previous Mars lander). "We had the usual clutch of acronyms, deities and inspirational words, but when we got down to the short shortlist - it was the obvious choice. It ticks all the boxes," Dr Sue Horne, the head space exploration at the UK Space Agency, told BBC News. "Rover McRoverFace" was suggested but the UK Space Agency made it clear at the outset that there would be no repeat of the furore that accompanied the naming of Britain's new polar ship. The rocket that will send the Franklin rover to Mars is booked to launch in July/August 2020. The various components needed for the mission are gradually coming together under the direction of Esa and its partner on the venture - the Russian space agency, Roscosmos. 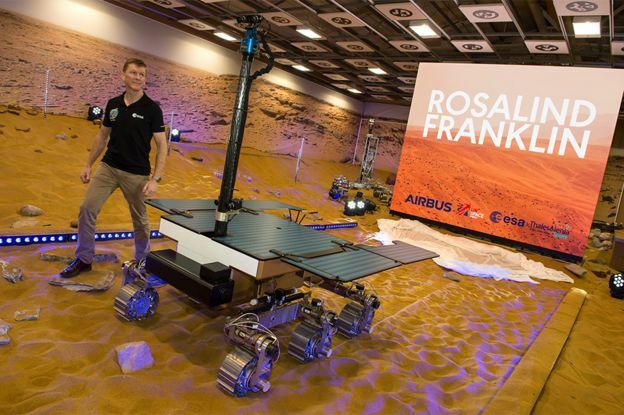 On the Côte d'Azur, the Franklin rover will be integrated with its German "cruise" capsule, which will carry it to the vicinity of the Red Planet, and the Russian landing mechanism, which will have the all-important job of putting the rover down safely on the surface of Mars in March 2021. The schedule is tight, conceded Prof Jan Wörner, the director-general of Esa: "It's a challenge but we're working really hard to make the launch date." 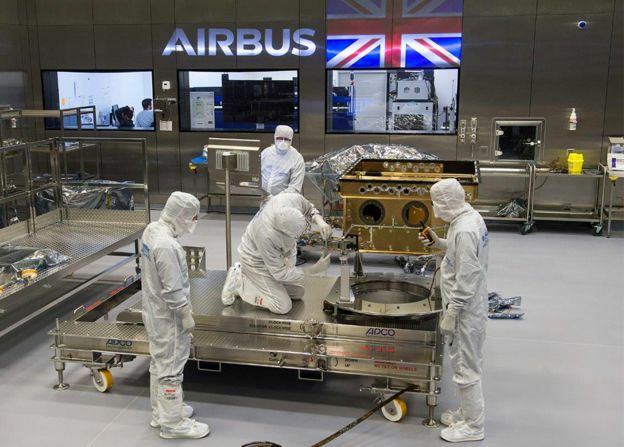 Airbus has built a special "cleanroom" to assemble the rover. The Franklin vehicle's parts are being brought to Stevenage from across Esa member states and Canada. The North Americans are making the locomotion system - the wheels.